﻿ Ramses Hilton Hotel Kaherah. JIMAT di Agoda.com! Ada soalan mengenai Ramses Hilton Hotel? 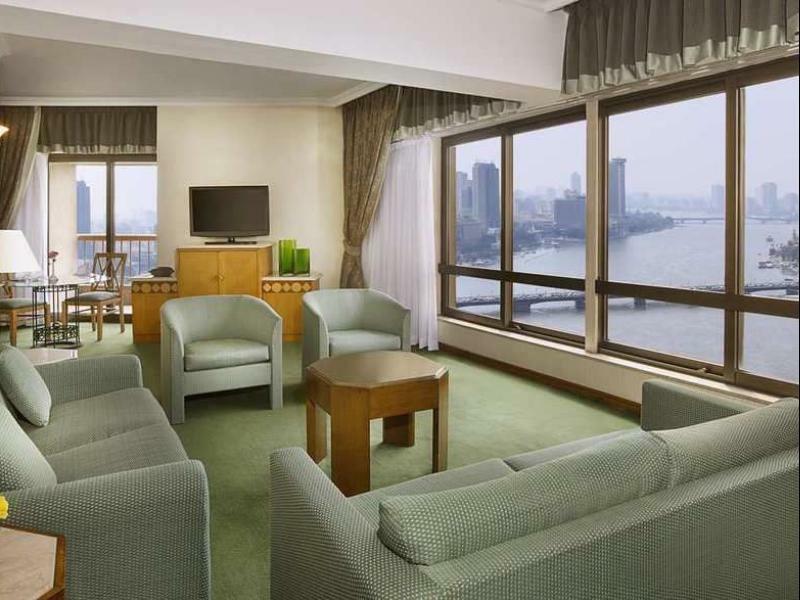 Jika apa yang anda cari adalah hotel dengan lokasi menyenangkan di Kaherah, cuma perlu lihat Ramses Hilton Hotel. Keseronokan pusat bandar hanya sejauh 1.Km sahaja. Pelawat yang datang ke hotel boleh melawat tarikan utama di bandar ini seperti: Pasaraya Rames Hilton, Pusat Pool Pasaraya Ramses Hilton, Muzium Mesir. Ramses Hilton Hotel juga menawarkan banyak kemudahan untuk memperkayakan penginapan anda di Kaherah. Kemudahan utama hotel termasuklah khidmat bilik 24 jam, Wi-Fi percuma semua bilik, pengawal keselamatan 24 jam, kedai runcit, pengemasan harian. Suasana Ramses Hilton Hotel terpancar di dalam setiap bilik tetamu. televisyen skrin rata, internet wayarles, bilik larangan merokok, penyaman udara, pemanas hanyalah sebahagian daripada kemudahan yang boleh didapati di hotel tersebut. Sepanjang hari anda boleh menikmati suasana yang santai dengan tab panas, pusat kecergasan, sauna, kolam renang terbuka, rumah urut. Ramses Hilton Hotel merupakan pilihan yang bijak bagi pelancong ke Kaherah, menawarkan penginapan yang santai dan mudah setiap kali. It was really great staying at Hilton Ramses; I stayed at the executive floor, they assigned special reception (in the 29th floor ) away from the congested normal lobby area; the staff were very helpful and friendly, the executive lounge is open from 6 AM, till 11 PM; they offered good breakfast and dinner in the lounge free of charge; the receptionists (Suzan and Hanan) were very good . I will stay in this hotel in the future. THE STAFF WERE PROFESSIONAL , VERY CARING MADE US FEEL LIKE WE WERE PART OF A FAMILY. WE WERE SAD TO LEAVE!! NO MATTER WHAT WE NEEDED THEY WERE THERE AND OFTEN ASK IF WE WERE COMFORTABLE!! MALAN DUTY MANAGER AND SAMI WERE THE MOST WONDERFUL STAFF THANK YOU BOTH ARE AMAZING!! SAMI EVEN RUNG TO SEE WE ARRIVED SAFELY IN ALEXANDRIA :) FURTHER MORE ILL LIKE TO ADD TAMER TEWFIK ONE OF THE MOST LOVELY STAFF WAS ALWAYS ATTENTIVE AT BREAKFAST CHECKING UP ON US AND ALWAYS SMILING AND HAPPY WE THANK HIM SO MUCH.... TO FOLLOW AT BREAKFAST KHALED, AYMAN,SAID,NANCY,SHAIMAA,YOUSRA, AND THE JUICEMAN AND THE 2 WAFFLE PANCAKE MEN DIDNT CATCH THEIR NAMES ALL WERE AMAZING GREETING US EVERY MORNING TAKING TIME TO ASK US HOW WE ARE ETC THANK YOU FOR ALL YOUR HOSPITALITY WE ARE FOREVER GRATEFUL FOR ALL OF YOU ALSO THE RECEPTION STAFF AND CONCEIRGE ABDEL HAKIM, BOTH MOHAMEDS, OMAR ,MAGDY,AHMED ALL STAFF I COULDNT GET ALL THEIR NAMES A HUGE THANKS !! GOD BLESS YOU ALL ALWAYS CANT THANK YOU ENOUGH!! 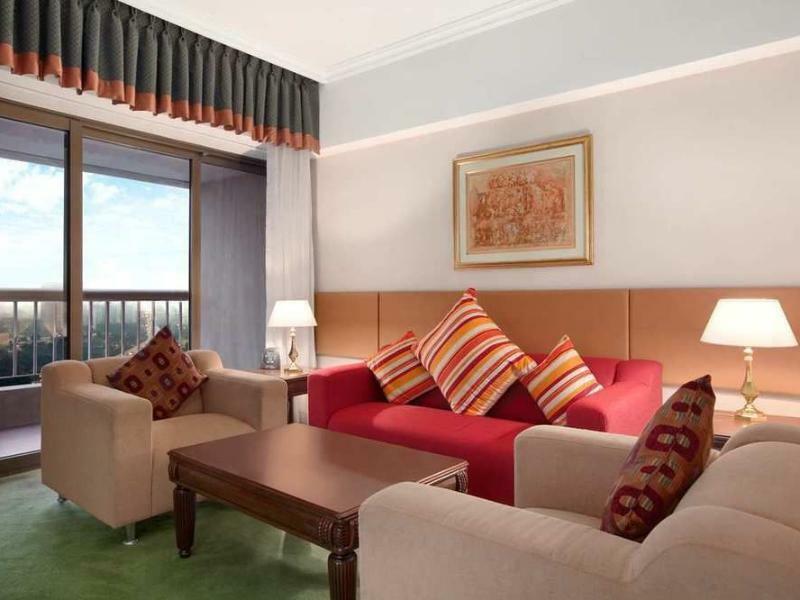 Rames Hilton is located in heart of Cairo. It is closed to Egyptian Museum, Khan al khalili, and much more touristic places. Breakfast also very good, they have special juice section, so you can have fresh juice. 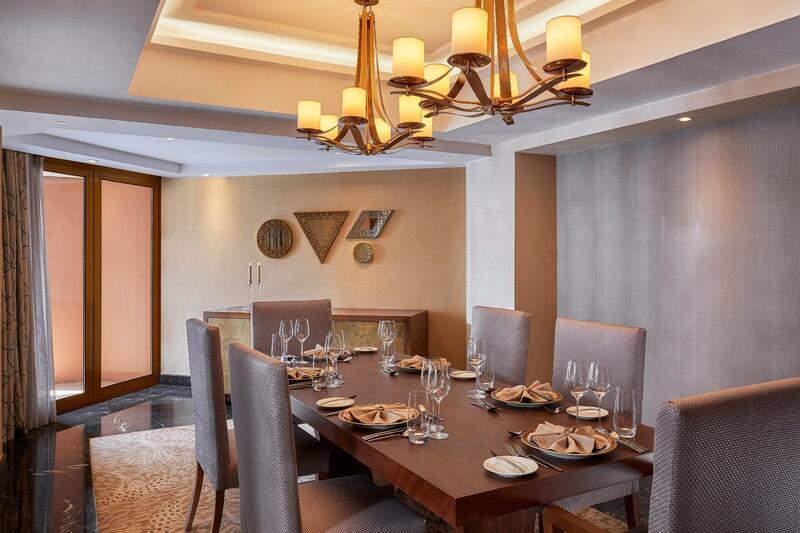 We stayed at the Ramses Hilton for three nights in late April 2015. The service was top-notch, the location is excellent, and while we didn't try any of the restaurants, the breakfast was great. Unfortunately, the rooms are a little worn down, and the windows aren't terribly sound proof, so some noise from nearby seeps through into the room. 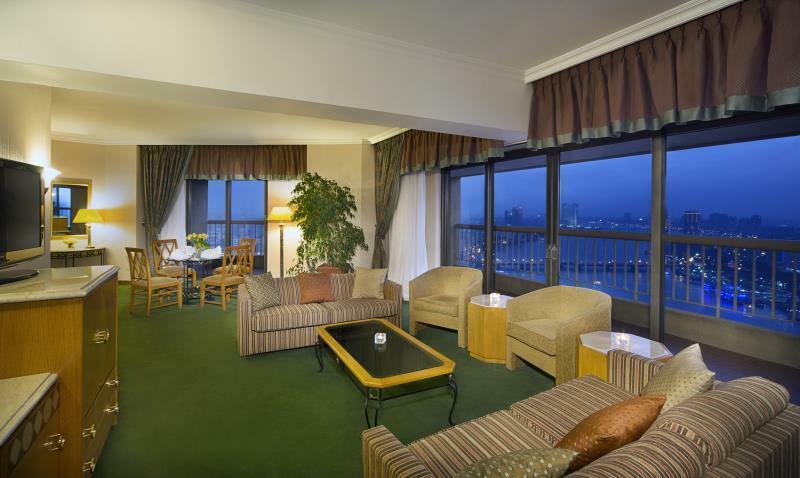 PRO: - Amazing service: I'm a Hilton Honors member, so we were upgraded to a suite with a view of the Nile. Staff were always helpful (whether it be with local directions, procuring a cab, or some basic translation), and overall the service was excellent. In particular, the guest service manager (Fatma Abbas) did a great job taking care of us. 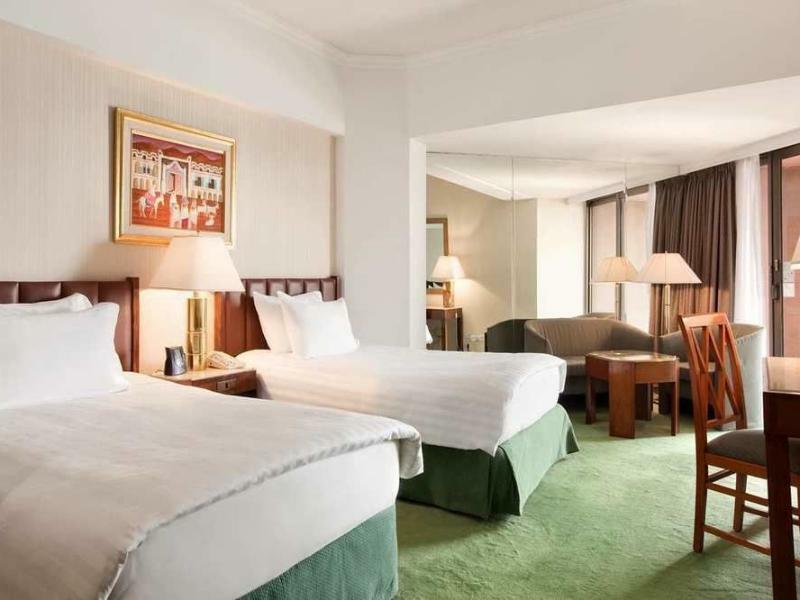 - Great Location: The hotel is right across the (incredibly busy and difficult to cross) street from the Egyptian Museum, and a short walk from some restaurants and shops. 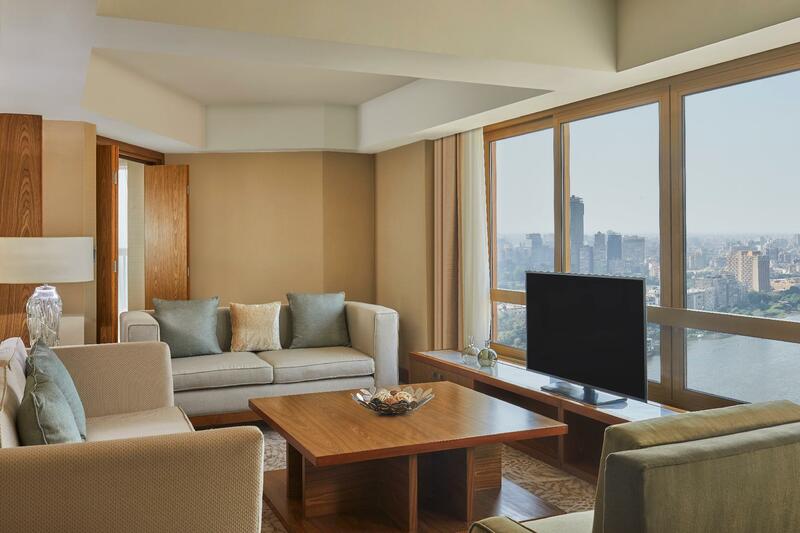 It's a short cab ride to a lot of major tourist attractions and places to eat, and while the hotel has cabs available, regular Cairo taxis are also really easy to get from right outside. - Breakfast: The breakfast had a wide variety of Western and Arabic options, and it all tasted good. We even had one really nice member of staff manning the omelette station who helpfully taught us which were the appropriate condiments to put on our 'fool'. 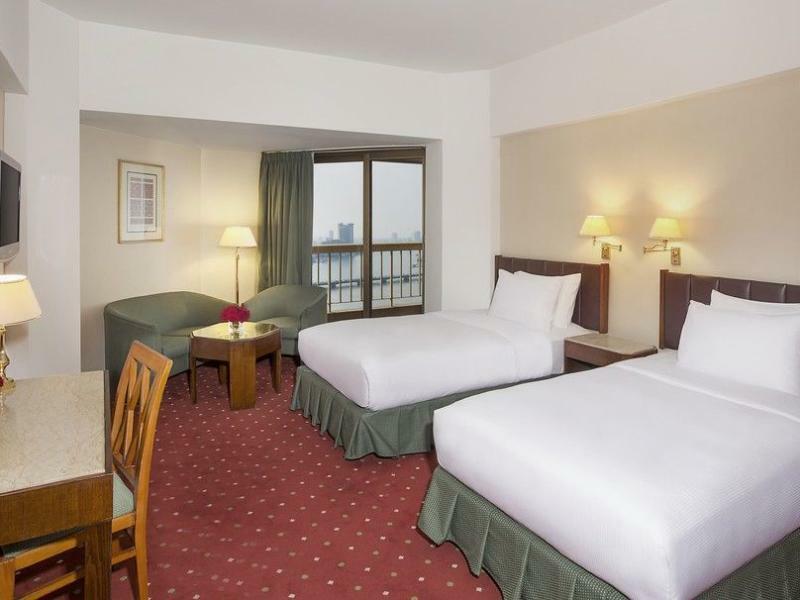 CON: - Dated rooms: Our Nile View Suite had a great view, and a nice balcony. Unfortunately, the room was quite dated and while nothing was wrong with the room itself, it could do with a bit of a re-do. Also, the windows had really nice views, but weren't fully soundproof so even though we were on the 21st floor, traffic noise still made its way through. - Wifi: Small complaint, but the wifi never worked in our rooms (only in the breakfast area). 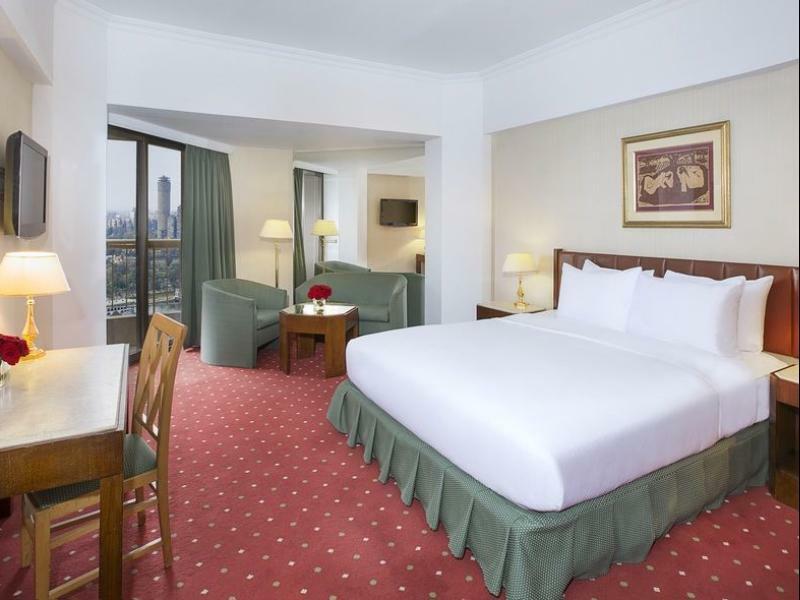 All in all, the Ramses Hilton is a great hotel in a great location. 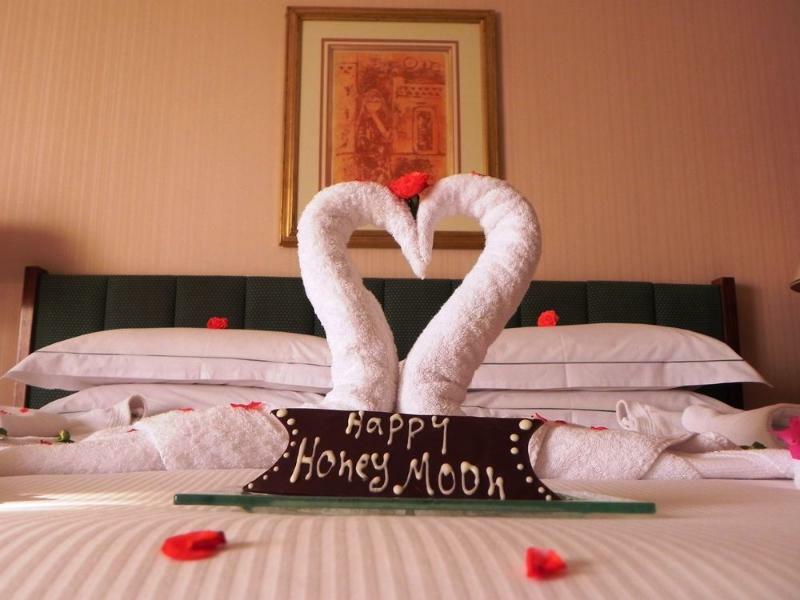 The rooms aren't perfect, but still really good, and the staff more than make up for it. I would happily recommend this hotel. Great location on the nile , nice breakfast, efficient and smooth check in and c heck out. very friendly staff specially at the reception. 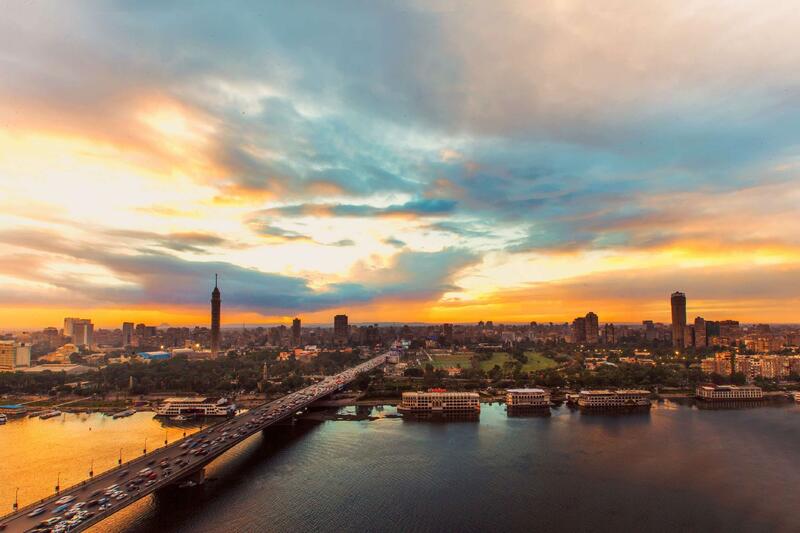 In the center of Cairo, the public night nile boats takes a 30 min circile in the nile should not be missed. The hotel all in all is old and needs renovation. Check in is chaotic- no clear queuing system and (as so often in the region) people pushing in with “Could I just...?”-type questions. The room furnishings are outdated and the bathrooms in particular need completely renovating. Cleaning g staff speak little or no English so do not understand basic requests. First problem was they couldn't find our booking, even after we showed them the booking confirmation voucher. We were told to ring agoda and sort it out ourselves. It's nothing to do with the hotel. Obviously not satisfactory so I went to the general manager on duty who did help us, gave us false not heartfelt apologies but did actually "upgrade" our room. However the room was terrible and badly in need of renovation. Shower didn't work until maintenance fixed it on his 4th visit, then maintenance guy hung around for 10 minutes obviously wanting a tip. It's an old, tired hotel with staff that treat you as a piece of meet on a hotel assembly line. Recommend to avoid. The hotel is close to the museum, but in the old city of Cairo, dirty and in disorder. The facilities in the hotel is old, but very clean and nice decorated. Staff are friendly and helpful. I don't like Cairo too much, but the hotel is good. We have some cities in Egypt to visit, Cairo is our first destination, then we will be in Alexandria, then back to cairo. During our travel, the staff Sammy from concierge help us to book the excurison and help us with train tickets and arragne our luggage to airport which we need not be back to Hitlon, and he kindly call me for many times for my agenda changed, and he communicated with me actively, this egypt journey thanks to him, it is very comfortable, if there is next time, i still choose this hotel as my place, thanks to it. It was ok, but I was surprised to find out that there was no complimentary bottled drinking water in the room, only cost about 35-40 cents $, which charge for $3. Also no way to make hot water in the room. Hotel located at busy junction. While facilities are dated, generally stay was comfortable. it is good hotel and we enjoy it. location is perfect. everything around you. 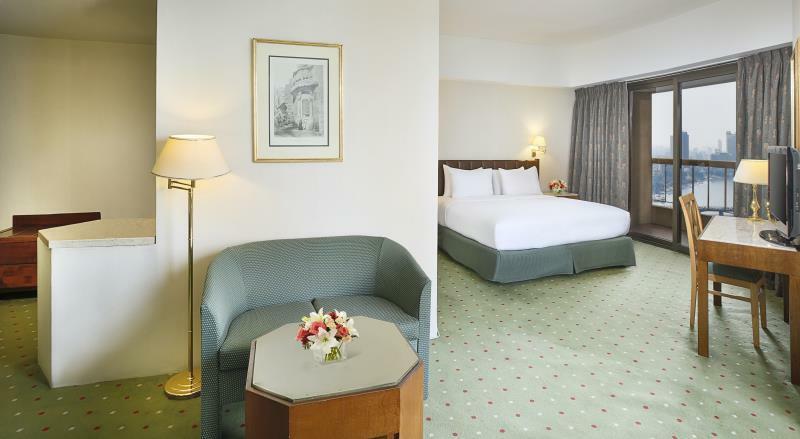 Fast check in , clean room with comfortable bed. Staff were helpful and friendly. Breakfast was good. Hotel location was good; in the center of Cairo and overlooking the Nile river. location is nice . very comfort and clean . staff are very friendly . It is really fantastic . Hotel is very clean and confort . Breakfat is fine . Location is good . Staff are very friendly , well mannar . We all enjoy very much at our stay .